Similar to a giant screw, the piles are driven into the ground using specialized equipment and are anchored into place thanks to a helix plate situated at the bottom of the shaft. The piles can therefore securely support structures such as houses, patios, garden sheds, fences and much more. The piles can be used to support new or existent structures. Contrary to concrete foundations, screw piles are installed below the ground’s frost line and are impervious to ground movements. They therefore offer unparalleled stability even in poor soil quality and on inclines. How do Pro Post Foundations’ screw piles stand out from the lot? Made of galvanized steel and in conformity with the National Building Code under the CCMC license 13608-R valid across Canada, Pro Post Foundations screw piles are installed below frost level by our team of expert installers who are the heart and the very essence of Pro Post Foundations. 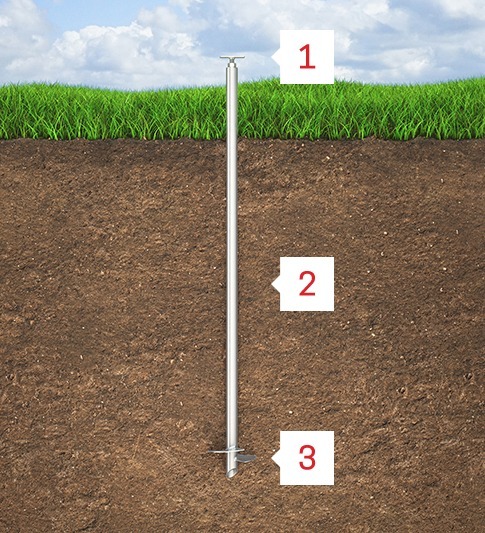 Pro Post Foundations is more than a quality product: it is a helical pile among the best of its category combined to an unequalled customer service and installation thanks to its innovative and polyvalent equipment that will have minimal impact on lawn and landscaping. Choosing Pro Post Foundations is choosing the best from each of what is part of a 100% satisfaction guaranteed screw pile installation. Fixed or adjustable, the pile head allows to adjust the level of the structure being supported. The central shaft comes in different sizes and lengths in order to fit the structure’s size, be it a new construction or a renovation. The shaft’s diameter and length will vary according to the load bearing requirements and the type of soil. At the bottom of the shaft, there is a circular helix plate that holds the pile in place. The helix plate anchors the pile under the ground’s freezing line and prevents it from being torn out of the ground. The plate size depends on the type of construction, the soil’s load bearing capacity and the weight of the structure. What sizes of screw piles are available? 1 ⁷∕₈ in. screw piles 8 in. 10 in. 2 ³∕₈ in. screw piles 8 in. 10 in. 12 in. 14 in. 2 ⁷∕₈ in. screw piles 10 in. 12 in. 14 in. 3 ¹∕₂ in. screw piles 10 in. 12 in. 14 in. What are the advantages of using screw piles? No damage to your property! Our team even makes sure to put back everything into place before leaving property! One installer using a minimum number of equipment for a more discrete installation and less damage to your property. Several workers and equipment needed on the construction site therefore generating higher noise levels and causing more damage to your property. Installation done by a certified Pro Post Foundations installer. You know your project is in good hands! Concrete pile installation does not require any certification, which means anybody can decide to become an installer. Installation is always possible, whatever the weather conditions. Installation is limited to frost free and dry weather conditions of the year. Precise leveling process done by our specialists. More difficult and less precise levelling process. No waiting time necessary! You can start building your structure the very same day! Concrete must cure completely before works begins, which means construction is delayed. The piles are fully guaranteed against manufacturing defects and so are the installation services. Guaranties are rarely offered for this type of product. Concrete piles can neither be moved nor reused. The piles can be installed under existing structures. Installation must be done before construction begins. No warping or movement possible. Nothing can impact the pile’s durability once it’s in place. It will not warp and the helix plate will hold it firmly in place, which means that it will not move up or down, whatever the type of soil it’s in. Deformation and movement possible. Many factors can affect a concrete pile’s durability and have it move up or down the hole it was cast in, i.e. type of hole, concrete composition, ground inclination, presence of water in the ground, etc. When installing screwed piles, require nothing less than piles in conformity with the National Building Code certified by the CCMC. Pro Post Foundations screw piles are certified in conformity with the National Building Code by the Canadian Construction Materials Center under License # 13608-R. Pro Post Foundations helical piles are proudly installed by certified specialists trained by the manufacturer. Their know-how and professionalism ensure total satisfaction on the installation of screwed piles. Pro Post Foundations uses a Kubota tractor for the installation of its screw piles. Equipped with turf tires, our versatile equipment has minimal impact on your lawn and landscaping. For complete peace of mind, Pro Post Foundations screw piles are fully guaranteed against manufacturing defects and so are the installation services.